This section is all about the information you are able to download. Simply select the direction you need and download the information. All templates can be easily found and downloaded in PDF file format. All templates are with clear review of each beach flag model and size. You only need to download the selected template and you will be able to edit it easily with the right software. For editing the templates we usually use Adobe Illustrator and CorelDraw, however you might use other software. It is important to indicate that our templates are made in layers. These layers contain different lines: bleed line which is in black color indicates till where your beach flag background should be extended to. This line is the line which we use to cut the beach flag. Cyan color line shows your actual beach flag size, while magenta line is a safe zone for your important information. Extend your background color or image to the bleed line to get the best results. If you don't have the right software for editing templates please contact us. We are offering graphic services for your beach flag design. 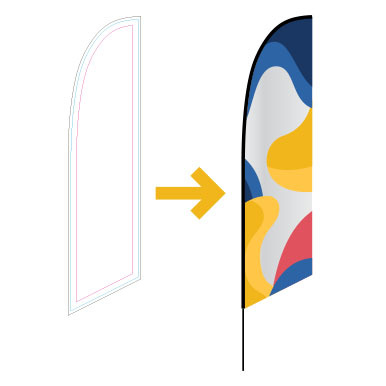 During the order process do not forget to add your selected beach flag model template with already prepared design, so we would receive it as well. A regular design check will be done in order to prevent errors, on same cases we would contact you or additional information. Here you are able to download the pricelists of our flags and beach flags. Simply click on the links below and just in few seconds you will receive the pricelist you need with all our prices. 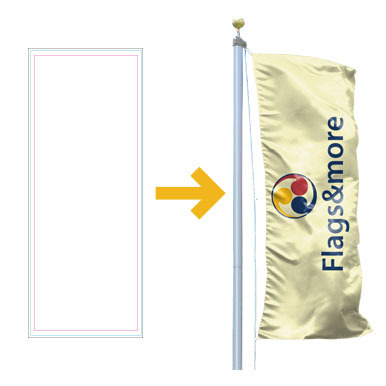 Inside every pricelist you are going to find possible combinations for your flag or beach flag model. All prices in our pricelists depends on the model, sizes, options and quantity you select. However, we also offer quantity discounts from 3% to 25% for same items! If you have any questions about the pricelists, models, dimensions and etc. contact us and we are going to help you!